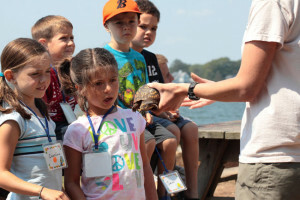 Education & Community Outreach: the popular Environmental Day Camp will celebrate its 20th anniversary in 2015. Make a Year-End Contribution Now! 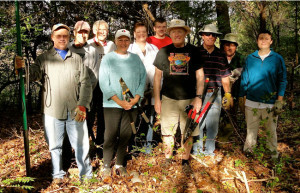 Branford Land Trust volunteers have been busy in 2014 carrying out the Land Trust’s mission to preserve Branford’s natural open space and to promote our communities appreciation of those important resources. Your generous support has made the success of our mission possible. We continued to protect additional properties, thanks to the generosity of long-time Branford families. Richard Hosley and John Barron gave the Land Trust several parcels of tidal marsh in the Town Meadow and elsewhere along the Branford River, and June Zielinski Emielita left her family’s 13.5-acre farm on Brushy Plain Road to BLT to be kept as open space forever. 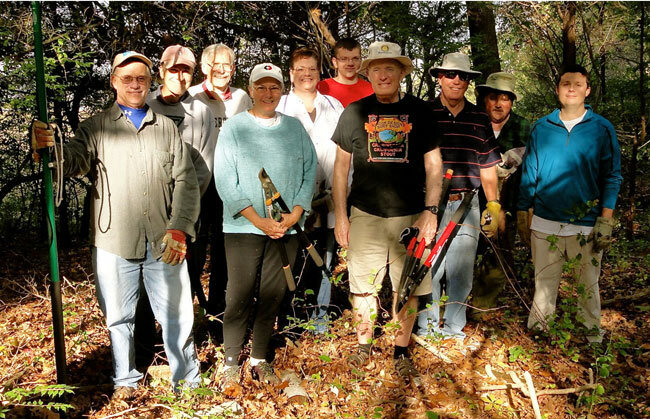 Property Management Work Party: Rotary and BLT volunteers at work party on Sybil Creek Preserve. The stewardship team has been very active. Regular monthly and special project work parties maintained trails, mowed fields, removed invasive plants and dealt with various other problems. We made significant progress in marking our boundaries and mapping our trails. We identified and worked to resolve a few minor encroachments by neighbors. And our Stewardship Fund has grown to $200,000, thanks to the addition of life memberships and several generous bequests. 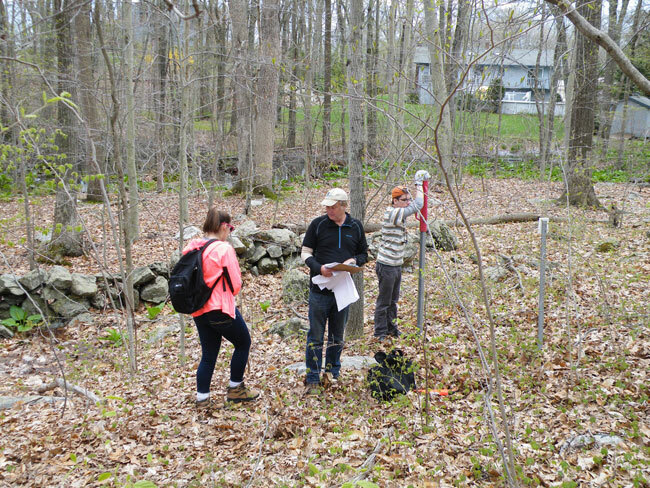 Property Management: Branford High School interns Rachel Ingraham and Rob Hardy worked with Larry Wheeler marking boundaries of BLT tracts. We introduced our friends and neighbors to Branford’s great outdoors with our Environmental Day Camp, Nature Explorer bird and foliage walks, animal tracking workshops, a Connecticut Trails Day hike, and the unique Branford River boat parade. Land Trust volunteers talked about osprey and horseshoe crabs in Branford schools and at the Branford Festival. 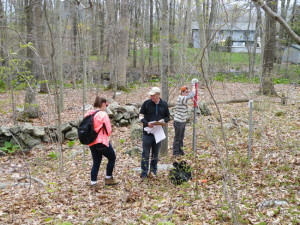 Two Branford High seniors did full-time month-long internships with BLT volunteers in May: surveying osprey nests, marking boundaries, mentoring younger students, and other helpful tasks. You have been able to read about our progress and activities on the Land Trust’s newly-designed website—one more effort to keep our community aware of Branford’s diverse natural resources. The site, designed by Words by Jen, includes a calendar of events, a blog, trail maps, online donation and dues payment options and much more! 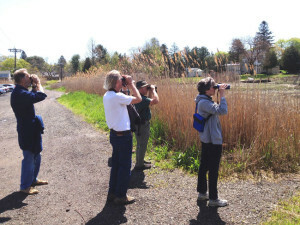 Nature Explorer Program: Presents hikes, bird walks, wildflower walk and more on BLT properties throughout town. 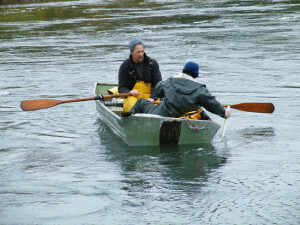 Protecting Natural Resources: CT Institute for Resilience and Climate Adaptation scientists Kay Howard-Strobel and David Cohen deploy water depth and velocity instruments in Jarvis Creek. On a broader scale, the Land Trust is paying increasing attention to sea level rise and its impacts on Branford’s coastal open space resources. BLT and the Town’s Select Committee on Open Space Acquisition worked with The Nature Conservancy to identify properties that will likely become coastal wetlands as sea level rises (Branford’s marsh advancement zone) so that they can be protected from development. The Land Trust is now working with scientists from UConn and the Connecticut Institute for Resilience and Climate Adaptation to accurately characterize the hydrology of the Jarvis Creek estuary to better understand how BLT’s Jarvis Creek Preserve and neighboring properties will be affected by rising water. Branford’s growing legacy of preserved woods, wetlands, fields and farms cleans our air and water, protects us from storm damage, provides wildlife with places to live, and gives our children natural areas to explore and enjoy. Your past support of the Land Trust has made it possible for our all-volunteer organization to preserve this legacy for future generations. We now ask you to consider making a generous end-of-year contribution, joining with the Land Trust as it continues working to preserve Branford’s diverse natural features. Please click here to make a tax-deductible donation today!